Sugar is not only bad for the inside of your body but it is bad for the outside of your body as well. For this reason, buy salt based body scrubs and leave the sugar on the shelf. Sugar suppresses your immune system. Sugar upsets the mineral relationships in the body. Sugar can increase reactive oxygen species (ROS), which can damage cells and tissues. Sugar can produce a significant rise in triglycerides. Sugar reduces the body’s ability to defend against bacterial infection. Sugar causes a decline in tissue elasticity and function – the more sugar you absorb or consumer, the more elasticity and function you lose. Sugar reduces high-density lipoproteins (HDL). Sugar interferes with the body’s absorption of calcium and magnesium. Sugar can cause varicose veins. Sugar can lower the amount of Vitamin E in the blood. Sugar can interfere with the absorption of protein. Sugar can lead to eczema in children. Sugar can impair the structure of DNA. Sugar can change the structure of protein. Sugar can make the skin wrinkle by changing the structure of collagen. If you are currently using sugar based body scrubs consider a healthier alternative that is actually great for your skin. This entry was posted in about body scrub, epsom salt vs sugar, harmful affects of sugar, healthy skin, Mikios natural body scrub, organic skin care, skin, skin and health, sugar and skin, Uncategorized and tagged about body scrub, Body Scrub, espom salt body scrub, Mikios Natural Body Scrub, salt body scrub, sugar, Sugar Body Scrubs, uses of epsom salt for beauty, uses of lavender. We use Epsom Salt in Our Body Scrubs because Epsom Salt is Great for All Skin Types. Here are the many health benefits of using our Epsom Salt Body Scrubs. This entry was posted in about body scrub, antioxidants, bath, beauty, body scrub, body scrubs, chemical free products, cure dry skin, epsom salt, Epsom salt body scrubs, Uncategorized and tagged about mikios natural body scrub, bath and body, Body Scrub, Body Scrub Information, cure dry skin, Epsom Salt, Epsom Salt body Scrubs, Mikios Natural Body Scrub, uses of epsom salt, uses of epsom salt for beauty. Did You Enter Our Contest? What Are You Waiting For? We Have Some Yummy Body Scrub Waiting for the Winner! 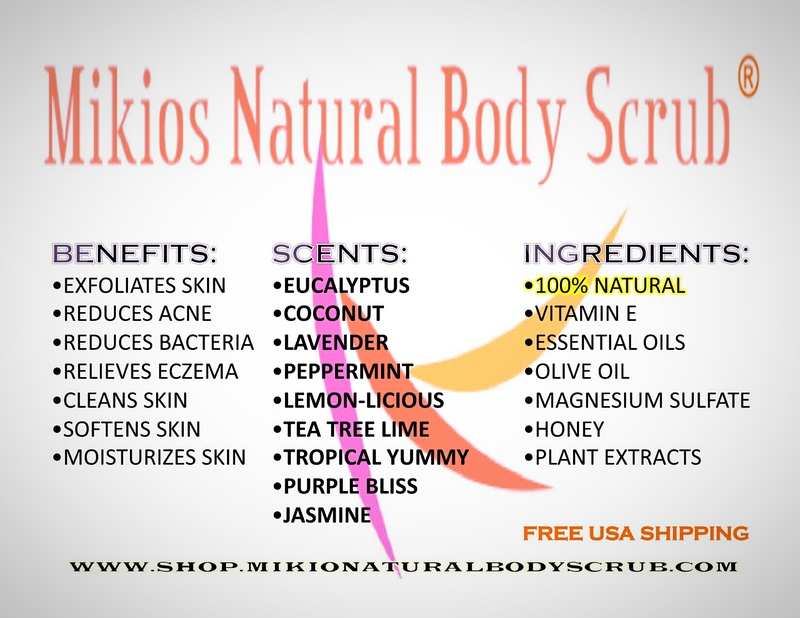 This entry was posted in about body scrub, body scrub, contest, Mikios natural body scrub, Uncategorized and tagged Body Scrub, contest, Mikios Natural Body Scrub. Pollution that affects your skin includes two components: particle matter of various sizes, which is the visible black soot you wipe off your face, and gasses such as ozone, nitrogen dioxide, sulfur dioxide, and carbon monoxide. The ozone layer (that impacts skin) is highly reactive with everyday pollutants from things like air, chemical manufacturing plants, cars/buses/trains, water, and dust particles. These things react with the UV to create a carcinogenic factor that not only breaks down proteins but and destroys the lipids in our skin. Air pollution in urban environments may more than double skin damage from the sun, especially in exposed areas like the face, neck, and hands. Note: Click on highlighted areas below for further information about highlighted topics. Remove the toxins by cleansing with non-chemical products. Don’t use chemicals to take away chemicals. That makes no sense. Use Antioxidants–they are the key to fixing the effects of pollutants on the skin because they help to stop free radicals. Use Skin Products that are high in vitamin E.
Drink Clean Water; it doesn’t make sense to drink polluted water and expect to have vibrant skin. Exfoliate Skin to Remove the dead skin. Use a Water Filter in Very polluted areas where Rivers include Known Pollutants. Avoid Skin Cancer, the most commonly diagnosed cancer in the United States, and in most cases are preventable. Read how here . Eat and Drink Healthy. If you have questions about this ask your healthcare provider to review what you are currently eating and suggest alternatives to improve your diet. We pay health insurance to be “healthy.” Take advantage of the free health programs that come with so many health insurance providers. Exercise Daily-Exercise helps to heal the skin, reduce stress (that affects skin), and heal the body. Exercise increases blood flow and helps nourish skin cells and keep them vital. Blood flow also helps carry away waste products, including free radicals. Join Free Fitness Programs like “Silver Sneakers Fitness Program.” This program is generally provided by your health plan at no additional cost. The program is an insurance benefit included in more than 65 Medicare health plans. Through SilverSneakers, health plans and group retirement plans provide a gym membership at these locations (click here) to their insured, usually at no additional cost. Find out if you are eligible and get your membership card: (click here). The author T. Bohler, owner of Mikios Natural Body Scrub, makes and sells chemical free salt body scrubs that exfoliate, detox, soften, and clean skin. She believes that the condition of the skin is influenced by skin products, diet, nutrition, exercise, and the environment. This entry was posted in about body scrub, antioxidants, beauty, body scrub, cure dry skin, dry skin, healthy skin, Mikios natural body scrub, skin and health, skincare, Uncategorized and tagged antioxidants, Body Scrub, Mikios Natural Body Scrub, skin health, skincare.